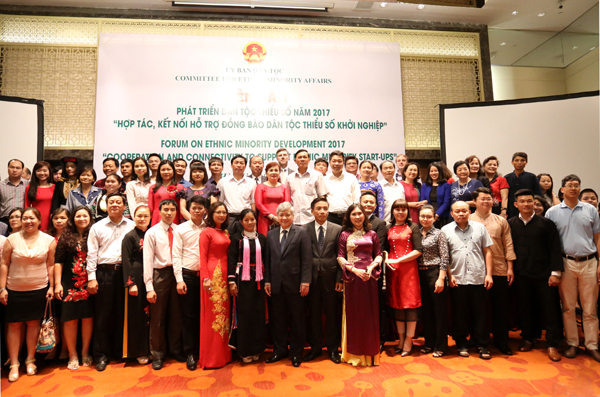 On June 16th, Hanoi, the Committee for Ethnic Minority Affairs launched the 2017 Ethnic Minorities’ Development Conference: “Cooperating, connecting and supporting ethnic minority people to startup”. Mr. Do Van Chien, member of the Central Executive Committee, Minister, Chairman of the Committee for Ethnic Minority Affairs and Mr. Achim Fock, Director of World Bank in Vietnam co-hosted the Conference. Attending to the Conference, there are: Deputy Ministers, Vice Chairmen of CEMA; representatives of some related Ministers, agencies; some local; ambassadors; representatives of international organizations; sponsors, enterprises inside and outside Vietnam along with 200 ethnic minority representatives whom successfully startup or need startup’s support. The 2017 Ethnic Minorities’ Development Conference: “Cooperating, connecting and supporting ethnic minority people to startup” is a chance for researchers, policy makers, partners supporting startup, international organizations and startup enterprises of ethnic minority people can share, discuss to find solution for better connection, support for the aim of Vietnamese ethnic minority communities: promote the internal force, overcome difficulty, reach to better life. The Conference’s aim is help ethnic minority startup groups understand what the difficulties are they have, what they need and find valuable linked chain with ethnic minority enterprise, attract community’s, public-private international partners’, scientists’, social resources’ attention. Through the Conference, they have a chance to access the policy, upgrade startup ability, create jobs, raising the income and have sustainable poverty reduction, connect to the startup network, conserve ethnic knowledge, integrate and confident, proud of their ethnic group, etc. Addressing at the opening of Conference, Minister, Chairman Do Van Chien emphasized: CEMA determines that poverty reduction tasks and sustainable development in ethnic minority area must base on the internal force of ethnic minority people. High and mountainous area is large, have many natural resources, diverse products, cultural diversity with deeply care of Party, Vietnamese Government; therefore, Vietnamese mountainous and ethnic minority area need to be seen as a land of developing opportunities. The Minister also said in his term, Vietnamese Government has commitments and very specific action plans to build a tectonic, incorruptible Government to have an action and serve people and enterprises. The Minister deeply thanked to developing partners, Broads, Ministries, agencies and local areas for accompanying, supporting CEMA as well as having a special care for startup in mountainous and ethnic minority area. The Minister hoped that, CEMA will continue to receive the cooperation, connection of all partners to support ethnic minority people to overcome themselves, integrate and together develop with Vietnam. Expressing the happiness for accompanying with CEMA to support startup in Vietnamese ethnic minority area, Mr. Achim Fock, Director of World Bank in Vietnam said: Vietnam has achieved many accomplishments in poverty reduction and has been recognized by the world. However, the rate of poor households in ethnic minority community right now is triple than the average rate of entire country because of many reasons (education, social security and livelihood). Therefore, the startup program not only develops livelihood but also attracts fund and people, aims to the support for ethnic groups, especially women. The Conference is a chance to attract investment and discover new approaches, create more chances for ethnic minority to startup and develop their business in their hometown and out of their community. Thereby, we need to have solutions to help them sustainably startup for a long term. At the Conference, representatives listened to the Group No. 569 of CEMA as well as international organizations introducing the current situation of Startup in ethnic minority community, policy and reality of approaching to ethnic minority startup groups; sharing cooperating model among scientist – advisors – ethnic minority startup community which is based on traditional knowledge, sustainable poverty reduction in SAPANAPRO company; developing cooperating public – private – community relationship in supporting ethnic minority startup community. Sharing the related contents of starting a business – association, Mrs. Nguyen Thi Huyen – Coordinator of International Labour Organization (ILO) said, to start a business need desire, motivation, knowledge and skill but cannot lack supporting environment, fund and market. She also talks about the necessity of public – private – community partnership in startup as well as lessons, suggestions including elements leading to success are integrated resources. According to the action plan supporting ethnic minority community to startup, connect and cooperate by “Public-private-international” social resources, Group No. 569 of CEMA aims to: “No one is left behind” including focuses on: Build database of startup organization and media; advance the startup ability; speed the startup, market development up; establish cooperating network supporting startup and usally discuss about policy. The group also set a goal that there will have approximately 100 enterprise which successfully, efficiently startup in ethnic minority area in 2 years. Addressing at the end of Conference, Minister, Chairman Do Van Chien emphasized: Mountainous and Ethnic minority area is the land having many advantages in crop productivity, livestock, local goods, pharmaceutical, cultural unique of each ethnic group, beautiful landscapes to start tourism bussiness, especially public tourism, etc. this is a chance for tourists to come to community, know the difficulties, connect, cooperate, help local people to raise business desire, overcome themselves to “reduce the poverty level, increase the wealthiness”. Minister, Chairman highly appreciated the action plan of Group No. 569 as well as commit to maximally support, solve all the work in his power to put this plan into practice, promote startup in ethnic minority community. On this occasion, Minister, Chairman Do Van Chien sent a message to the ethnic minority young generation: “Raise your business desire, be confident to promote your inner force, share information, cooperate and act fiercely”. Also, this startup conference is a chance for sucessful startup enterprise in ethnic minority area to introduce their signiture products. These products have the uniqueness of each area, showing the diversity of natural resource, local product, culture, etc. as well as potential affirmation, developing advantages of mountainous and ethnic minority area. At the Conference, CEMA and partners, enterprises, related sides signed the joint cooperation agreement and Memorandum of Understanding.